SENER Marine north America manager, Verónica Alonso, presents a paper that was written in collaboration with Rodrigo Pérez, SENER South Europe manager. SENER engineering and technology group took active part in the World Maritime Technology Conference 2015, the annual congress organized by the US association of naval architects (SNAME), which groups most part of the maritime industry. This time the event was hold in Providence, Rhode Island, in November from 3rd to 7th. 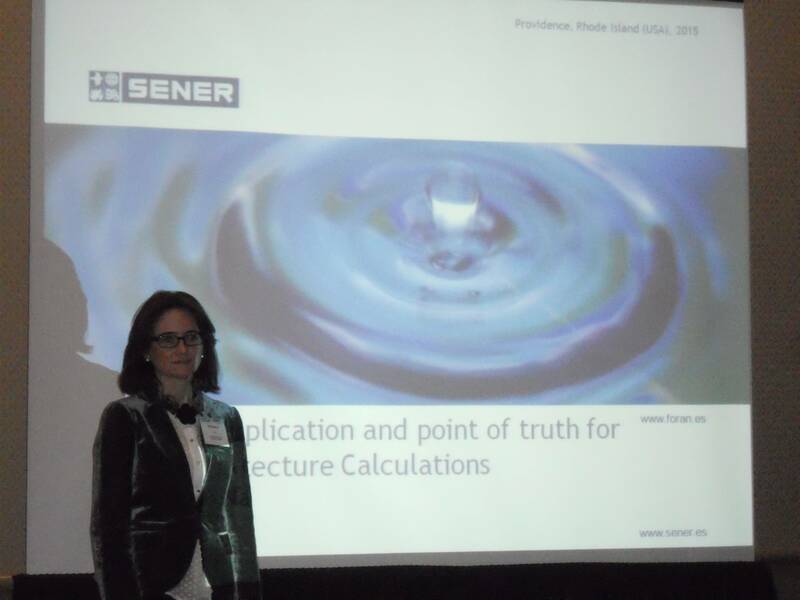 During the congress SENER Marine North America manager, Verónica Alonso, presented a work about the new FBASIC module of the FORAN System, written in collaboration with SENER Marine South Europe manager, Rodrigo Pérez. FORAN, a shipbuilding CAD/CAM System with more than 50 years in the market, had some modules for the naval architecture calculations from the beginning. SENER has recently developed a new and innovative application, FBASIC, which groups the former modules and incorporates new capabilities in order to aid the naval architects during the important tasks they have to carry out at early ship design stages. Some remarkable aspects of the new application are the possibility to calculate and evaluate dynamically stability criteria and longitudinal strength during the loading condition definition, the advanced management of the lightship weight distribution and the automatic insertion of graphs in the user-tailored results reports. FBASIC incorporates most part of the rules and regulations from the regulatory bodies, both for commercial and naval vessels, and also allows the definition of new criteria by he user. SENER has recently signed important contracts in the US, where is working to contribute in the optimization and growing of the sector.